Abrams Creek area is one of the best backpacking experiences in the Park. It is off the beaten path and away from the high traffic areas although it is pretty popular with the horse riding community. The beauty of Abrams Creek itself is shown off in many places and this out-and-back hike is no different. The trailhead for Rabbit Creek Trail is directly across from the ranger station at the front of the campground. Parking is just a hundred yards ahead. This particular hike was originally planned to be a part of a backpacking trip on the previous weekend that included most of all the other trails in this section but at the end of that hike, the notion of adding another 9 miles was not met in my mind with great enthusiasm. As it turned out it was fortuitous as the day turned out to be blessed with a sacred moment. For a day hike, this is definitely not a bad choice. There is plenty of water on the trail and Campsite #16 is in Scott Gap at the intersection between Rabbit Creek Trail and Hannah Mountain Trail. This hike started about 9:00 on a clear morning. 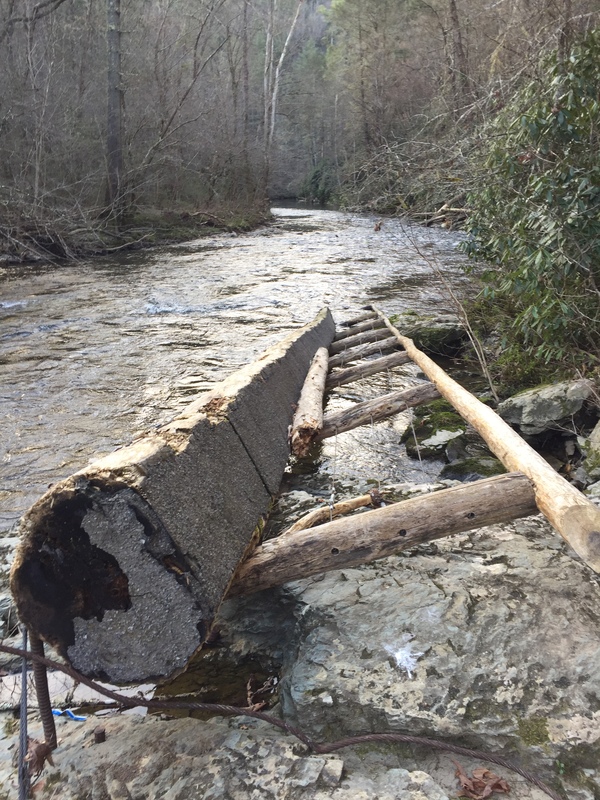 The trail crosses Abrams Creek at less than 0.2 miles from the trailhead and there is a footlog bridge. It should be made clear that at the time of this hike, the footlog was NOT actually across the Creek, but laying along the side as if turned on a hinge. The cabling broke free in a fairly recent bout of high water and left the bridge in a sad state, meaning the hiker must ford the Creek. As I am fond of this stretch of water, coupled with the warmth and beauty of the spring morning, wet feet were a small price to pay for contact with its refreshing flow. The ford was easy as the current was slow. The depth was no more than calf high. The first half mile of the trail is nicely level as it passes through lands that were once farms and homesteads. At 0.5 miles the trail begins it’s gradual assent up Pine Mountain. At 1.7 miles, there is some of the same wind storm damage you find along Beard Cane Trail. 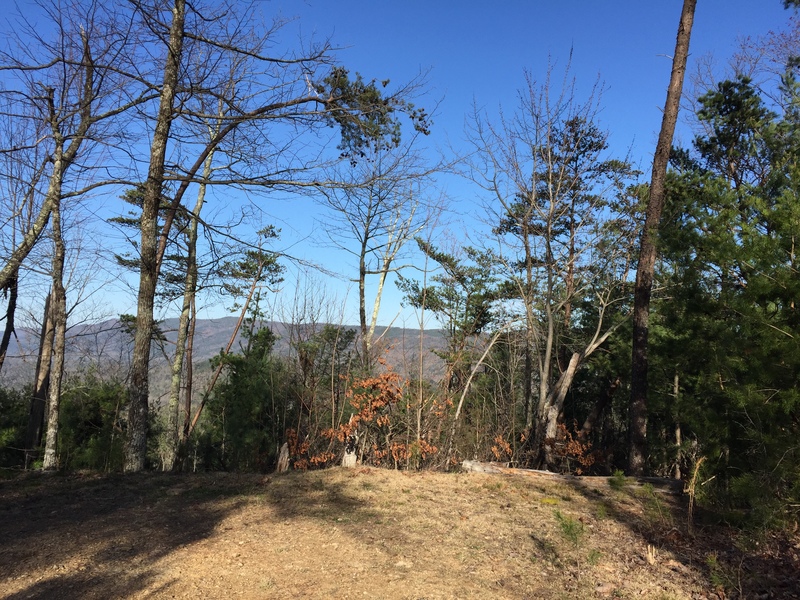 At 2.3 miles, views of Chilhowee Mountain come into view. The trail crests Pine Mountain at 2.5 miles and descends to the intersection with Hannah Mountain at Scott Gap. After 56 minutes and 2.7 miles of hiking, a short break was due in Scott Gap before heading on to the palindromic Hannah Mountain Trail back toward Abrams Creek. After 0.4 miles there is a nice stream and a better water source perhaps than the one at CS# 16. The hike goes through a pine forest complete with pine straw carpeting. At 1.7 miles, a wonderful sound comes to ear. It is the song of Abrams Creek. You arrive at the creek at 1.8 miles. Here, the 900 miler must face an ethical dilemma. 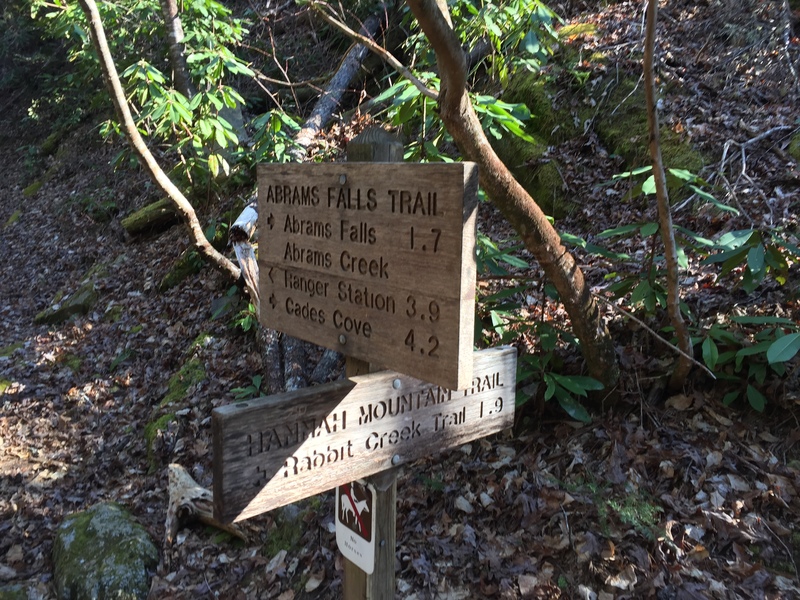 The Hannah Mountain Trail officially ends at the intersection with Abrams Falls Trail, which is across the creek. 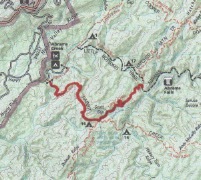 Those hiking the Cooper Road – Abrams Falls Loop would come there but have no reason to ford the Creek. 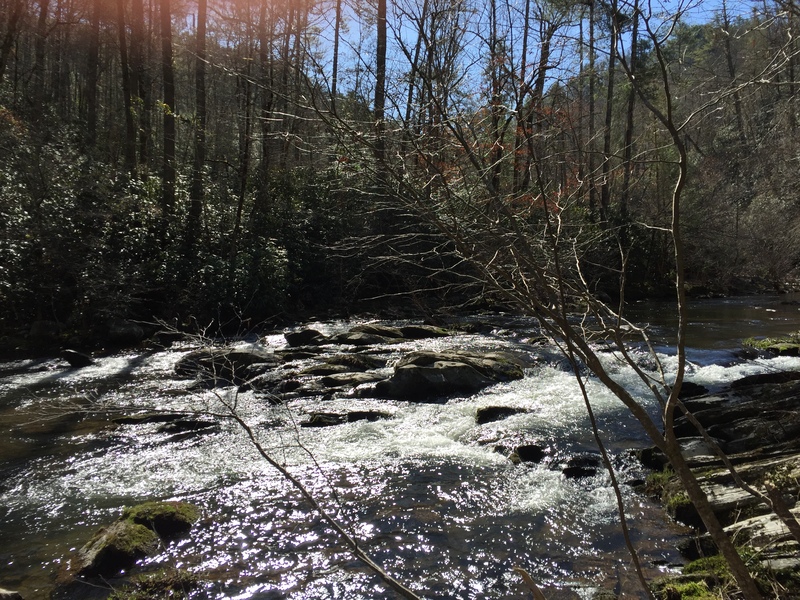 In February, it was my plan to hike the large loop that included the east side of Rabbit Creek back to Cades Cove. Alas, the water was treacherously high and the current too swift. But back to the ethical dilemma. Here I was on the other side with the decision before me. Do I ford the Creek and complete the last 30 yards or just wave at the sign across the water and check it off? It was a quick decision. I have a keen bond with this river (somehow the name “creek” does not afford enough majesty and respect to this ribbon of water) and today, the weather was warm and the water was low. With the aid of a couple sticks, the ford was complete in about 5 minutes. Now, this being a Yo-yo hike, there is no avoiding the fact that I had to turn around and come back. Two baptisms in a row! Once safely on the west bank, it was time to dry off and have lunch. Every time I hike alone, I invite a guest to come along. I have enjoyed conversations with the great Christian author, N.T. Wright, several great poets and the grandfather of my core philosophy as a hiker, John Muir himself. The freedom and openness of the wilderness makes great literature come alive in a way that other spaces simply cannot. This day was a discussion with Mr. Wright in his book, Following Jesus. He used a river as an example of explaining Heaven. You look across and see a car on the other side. The only way it got there was to cross through the river and yet, there is no way it could have made it. There’s no bridge and the water is too wide and deep. But you know it did. Wright is fond of describing Heaven as being God’s space and it’s not as far away as some traditions would make it seem. In fact it’s only a separation of dimension. A mere breath away. And sometimes, that veil is pulled back, if for only a moment, and in that one moment one experiences a sacred encounter. Having just crossed the river and returning, this insight suddenly became very real to me. “You see what I’ve been trying to tell you?” When one is allowed to see past the veil, the experience cannot be measured in time because on that side, time is eternity. Seconds, hours, days all come together in a mere moment that lasts forever. I don’t know how long I was there and I dared not defile the experience by noting the time. All I do know is that I pulled my shoes back on and retuned the way I came. The hike back to Scott Gap continued the conversation with Mr. Wright bouncing around my imagination, highlighted by a warm gentle breeze. The 2.7 miles on Rabbit Creek Trail started with a short climb of 0.5 mile to the crest of Pine Mountain. The descent made for swift hiking back to the trail head, exceeding 3 miles/hr. The creek comes into view as the trail levels out. Amazingly, there were daffodils on either side of the trail; perhaps a remnant of a former homesite. I don’t know how I missed them on the way out but given the blessings of the day already, I wound’t have discounted any explanation. At the end, I had to ford the Creek one last time; four times in the day. This last one was a bit of a thank you for the day, wet feet and all. There are trails and hikes on the 900 miler journey that are not exciting, nor are they memorable. Sometimes they are purely annoying. But you have to hike them so you can color your map. 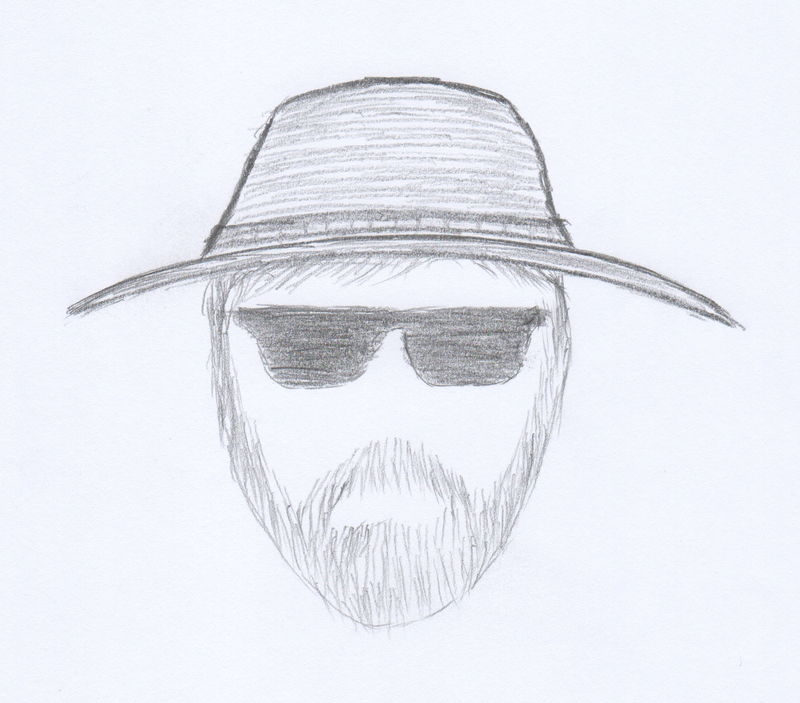 I approached today as one of those uninteresting orphans created by weariness on a previous hike. Adding to the annoyance was the long drive back into Abrams Creek Campground to get to the trailhead. But this one thing is for sure; had I gone ahead and hiked this section in February or on the previous weekend, I would not have had the experience I have shared. Had I decided to forgo fording the Creek at Abrams Falls Trail, perhaps I would not have taken the break and had the conversation with N.T. Wright in that space and in that moment. Sacred encounters are just that way. This entry was posted in Encounter Creation, Trail Log and tagged Abrams Creek, Hannah Mountain Trail, Rabbit Creek Trail on May 3, 2016 by blogginggazelle.